I’ve completed the book design for my second novel, A Greater Monster. The cover is done and below for your viewing pleasure. I’m quite happy with how it came out. All the design elements that make up the face are related to scenes in the story. If you are looking for a talented designer for a project, talk to my friend Mike who did this cover as well as the complex interior layouts: mikewilgus.com. Super talented guy. Next step is getting a print-on-demand printer to create about 20 galley editions with a plain cover to send to pre-publication reviewers like Publisher’s Weekly and the Kirkus Review. If they review it, that helps get bookstores and libraries to order it. There’s no assurance that they will review it, however. I also plan to take a couple galley copies around to bookstores in Chicago to see if I can get employees to read it and land an in-store review. I highly recommend authors take this approach themselves. The quotes. As promised in my last blog post. 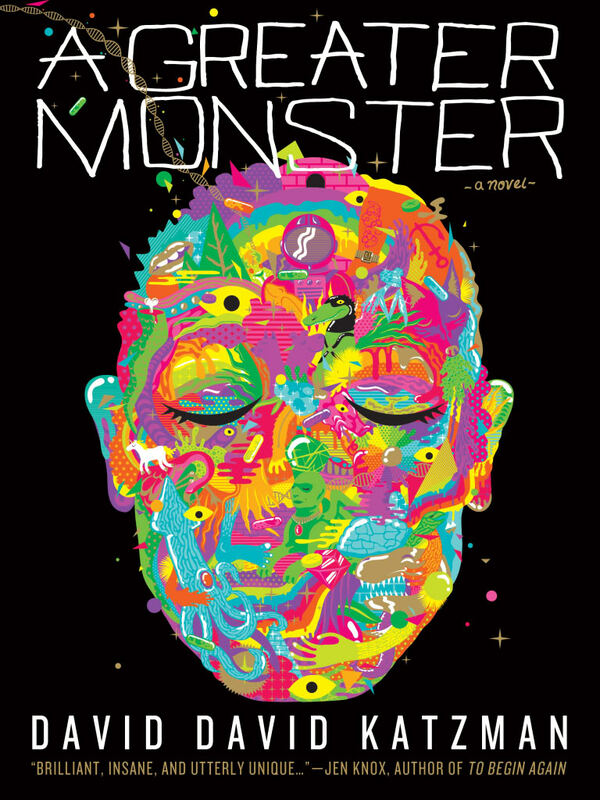 I have been very fortunate to meet several authors who generously spared time from their incredibly busy schedules to read an early manuscript of A Greater Monster and provide micro-reviews that will appear on the cover and interior. The full quotes are a little long for this blog post so I’m sharing the abbreviated versions here. I highly recommend these talented authors’ books, which I have thoroughly enjoyed reading (links provided). Finally, for authors who are self-publishing and feel the premise or nature of their work might intrigue individuals who like unusual, artsy projects, consider submitting your project to kickstarter.com. It’s a cool site that has gotten a lot of buzz from NYT, CNN, Wired, etc, as a new way for artists to pre-fund their work. First, because it’s a curated site you have to be accepted based on the artistic quality of your concept. Second, you have to offer creative rewards for donations, so one of mine is obviously that you can pre-purchase the book, but I also offered rewards that include a stream-of-consciousness email inspired by your name, a hand-written letter or an original short story inspired by anything you request. Thanks to 84 generous individuals, I just reached my goal and the fundraiser still has two weeks more to go. The book is being printed on 100% acid-free recycled paper, which is more expensive than regular paper, and that has added significantly to my printing costs. It helps to create professional quality video to garner interest, so check out what I did. Making it funny and entertaining helps as well. And Kickstarter blogged about my project here. I’ll be going to press in about two weeks.